I happened upon three discussions of environments yesterday. The first came via Stephen Downes with a link to to a post about the Telefonplan School in Sweden. The school was designed by RosanBosch. Other designs include the Efterskole, Brotorp and Sodermalm. These are some of the links to the coverage of these designs. A new CSIRO study shows that ecosystems we grew up with will be changed so much as a result of climate change that they will look, sound and smell completely different in years to come. The study is the first Australia-wide assessment of the magnitude of the ecological impact that climate change could have on biodiversity. It says the scale of the problem could have major implications for conservation policy and the management of Australia’s system of national parks and reserves. The report predicts that by 2070 most places in Australia will have environments that are more ecologically different from current conditions than they are similar. Shortly after interviewing Michael, Cameron spoke with Danica Leys. She is a co-founder of the social media platform AgChatOz, a community forum for rural Australians to connect and discuss issues affecting their lives. AgChatOz hosts a weekly discussion on Twitter on Tuesday nights from 8-10pm. This week there was a live event in Canberra. The great thing about #AgChatOZ is that allows farmers to tell their side of any story. It is breaking down barriers of rural isolation and allowing for consumers to engage with farmers and understand the inner workings of a farm and rural environment. With more than 50% of the world’s population under 30 years old, more than 80% of online Australians familiar with Twitter, and Facebook reaching nearly 1 billion users, it is no surprise that social media is one of the most powerful communication tools of the 21st century. Social media has allowed users of the AgChatOZ platform to have a global reach with relative ease. Our discussions have trended globally on Twitter more than twice, which has been one element of measuring our success. The calibre of groups and individuals participating and continue to engage also prove we are reaching the right audience, not purely “preaching to the converted”. We often engage with; Ministers, peak farm lobby groups, environmental groups, farmers and city consumers to name a few. Social media can empower and connect country people, it can assist in bridging the gap between “country and city” and it allows for the paddock to plate story to be told. It is vital and crucial in building relationships and forming a better understanding of the diversity of rural people, their lives and industry. Most importantly, it is crucial to remember that social media is simply a tool in the process of communication. Social media is not a “silver bullet” to the issues the industry faces and will continue to face, but it does provide a free, powerful and limitless platform to be heard. My environment day ended with showing a friend the INSPIRE Centre on the University of Canberra campus. It has been built with sustainable principles and supports approaches to learning evident in Swedish plans and #tag conversations. Categories: Community, Digital Media, Education, Farming, Teaching and Learning, Twitter | Tags: CSIRO, Eco Systems, Telefon Plan School, UCNISS | Permalink. Laura Hale has submitted her PhD thesis for examination. 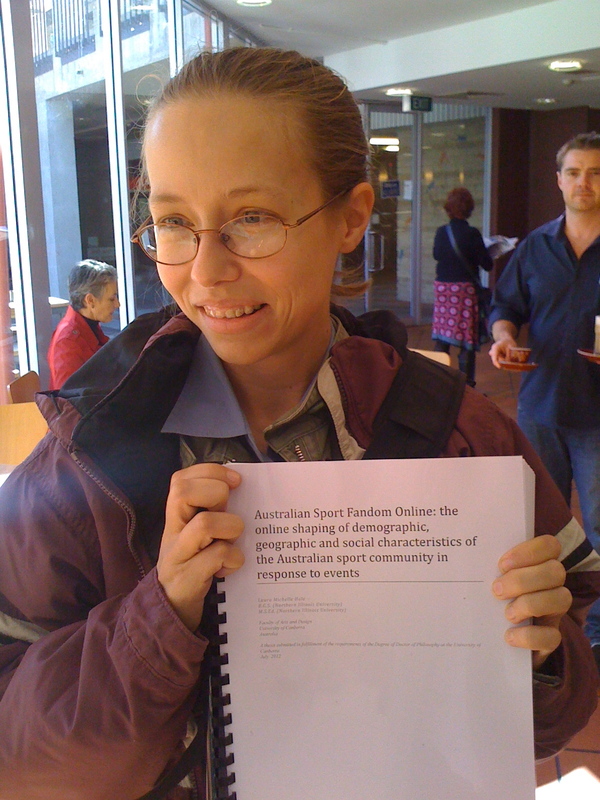 The title of her thesis is Australian Sport Fandom Online: the online shaping of demographic, geographic and social characteristics of the Australian sport community in response to events. The Internet has a glut of social media data available for use by researchers interested in the online sport community. Most of the existing research fails to use these data and relies on qualitative data to understand fan behavior and production. This thesis argues that a quantitative methodological framework provides a fertile approach to describe and understand existing Australian online sport fan communities. The methodological framework presented in this thesis is called Social Response Analysis. This analysis is informed by multiple existing approaches in order to examine online communities. The methodology is used to develop and present multiple case studies in Australian sport, with a particular focus on the National Rugby League and the Australian Football League and events that took in these communities during 2010 and 2011. This thesis argues that the value of Social Response Analysis is that it provides a grounded methodology that clubs and sport marketers can use to understand better their fans, their characteristics and how the online community composition changes over time and in response to events. Data Absent Context Can Change the Meaning: Did Julia Gillard Hurt the Bulldogs? Categories: Australia, Communication, Digital Media, Sport, Twitter | Tags: Fandom Online, Laura Hale, UCNISS | Permalink. I was fortunate to be on the road relatively early this morning. It was a beautiful drive from Braidwood to Canberra. A first day of daylight saving. I heard Bob Buckley’s interview with Ross Solly on ABC666 about World Autism Awareness Day. I admire Bob’s work immensely. He is a passionate advocate for A4 (Autism Aspergers Advocacy Australia). I think anyone who manages to combine a lifestyle that includes working in computational genetics, being a parent of a child on the autism spectrum and playing remarkable music will bring passion to advocacy in a very distinctive way. There is a Twitter stream around the world today using #worldautismday and #autism. This is the fourth World Autism Day. Categories: Communication, Twitter | Tags: #autism, #worldautismday, A4, ABC 666, Bob Buckley, Ross Solly, UCNISS, World Autism Awareness Day | Permalink. Categories: Communication, Computer Science in Sport, Creative Commons, Digital Media, Open Access, Sport, Twitter, Writing | Tags: ACCSS, Asian Conference of Computer Science in Sports, Japan Institute of Sports Sciences, Keith Lyons, OpenZine, Rafet Irmak, Twitter, UCNISS, Zine | Permalink. In December 2008 I came across the social media service provided by Ning. I am always keen to explore the functionality of social media tools and signed up for a Premium Service account with Ning. This account provided an advert-clear skin for the site. 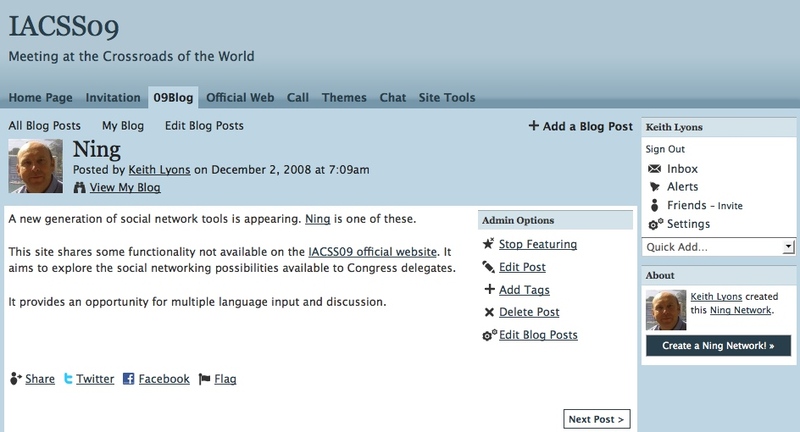 I thought I would use the IACSS09 conference as the focus of the Ning site. I have written about the site in a post titled Sport n.0: Connecting Social Networks. A rich ecosystem of tools supporting communities to share thinking, solve problems, and create innovative new solutions is a fountain of new value to the organization. This year Ning is changing account structures and a number of users of the service have chosen to migrate their content to other sites. I wondered if the word to describe this move was migratning. I have reposited the IOCSS09 Ning archive at this Box.Net link. Some Ning groups have moved their site content to Grou.ps. Ozgur Kuru provides some additional information about this process. This process has helped me understand the potential of social media tools and has underscored the importance of curating ephemeral content. Some material from the conference is unavailable including the official web site and the Twitter #iacss09 tag. Categories: Communication, Community, Digital Media, IACSS09, Networks, Twitter, Writing | Tags: Box.net, Dey, Grou.ps, IACSS09, Internet Archive, Ning, SlideShare, Sport n.0, Twitter, UCNISS | Permalink. Last year I wrote a paper for a special edition (Multimedia, the World Wide Web and eLearning in Sport) of the International Journal of Computer Science in Sport. The paper was rejected by a number of referees. The rejection was a salutary experience for me. I wrote the paper in the afterglow of the remarkable CCK08 on line course. I was enchanted (and remain so) about the possibilities of connected groups and the opportunities that arise from sharing openly with colleagues whose work resonates with one’s own work and thoughts. The paper seemed a great way to share some of these experiences. 1. News that Facebook has 500 million users and that “more than a third of those who use the internet worldwide sign in to Facebook to update their status or post photos”. This paper discusses a connectivist approach to the development of social networks in computer science in sport. Social networks have used Web 2.0 tools to grow their connections and the prospects for a Semantic Web 3.0 present enormous opportunities for all of us in our personal and professional lives. This paper uses the concept of Sport n.0 to explore how each of us in the computer science in sport community can grow our interconnections through the use of social media. A case study of the development of one social network site is presented as a heuristic to explore possibilities for connectedness. The paper concludes that a move to open access is a key to the sustainability of the International Association of Computer Science in Sport and the flourishing of the International Journal of Computer Science in Sport. In this paper I explore the social network possibilities open to communities of practice in computer science in sport. The paper is an exhortation to invest energy to create and develop open networks that share insights, knowledge and experiences that transcend language, geographical space and synchronous time. Alexandra Marin and Barry Wellman (2009) point out that “social life is created primarily and most importantly by relations and the patterns formed by these relations. Social networks are formally defined as a set of nodes (or network members) that are tied by one or more types of relations”. George Siemens (2008a) notes that “the advancements of the last several decades have made networks of learning explicit. Networks are reflected not only as physical information communication technologies, but as the very means through which knowledge is distributed for addressing complex challenges”. Jane Hart (2009) has done a great deal to promote and support social learning. She suggests that “Social Learning can create more powerful and enduring learning experiences through the use of online communities and networks, where learners are encouraged to co-create, collaborate and share knowledge and fully participate in their learning”. Stephen Downes (2006) has argued that “theorists will have to, like students, immerse themselves in their field, to encounter and engage in a myriad of connections, to immerse themselves, as McLuhan would say, as though in a warm bath. But it’s a new world in here, and the water’s fine”. This paper proposes that the computer science community immerse itself in social networks to engage theorists and practitioners in a discourse enriched by the possibilities of a Sport n.0. We are in an age of digital scholarship. Nancy Maron and Kirby Smith (2009) point out that this is an age of digital scholarship and observe that “as electronic resources for scholarship proliferate, more and more scholars turn to their computers rather than to print sources to conduct their research. While society journals, university presses, and conference proceedings still form the backbone of the scholarly publishing enterprise, alongside them many new digital scholarly resources have appeared, sprouting up wherever there is a devoted individual or team of scholars willing to create and nurture them”. Tony Bates (2009) considers that this digital scholarship is ‘embedded’ digital literacy and observes that “to be a scholar now means knowing how to find, analyse, organise and apply digital information. Studying without the use of technology is increasingly like learning to dive without water”. Rob Fitzgerald et al (2009) report the development of digital learning communities that are built by “an exploratory conversation between students, teachers, texts and technologies and that this is so whether learning is happening in the school, university, workplace, classroom, laboratory, or field”. In the call for papers for this special edition (Multimedia, the World Wide Web and e-learning in Sport) of the International Journal of Computer Science in Sport (IJCSS), Larry Katz and Christoph Igel observed that: “We are interested in papers that explore the innovative use of these tools and their effectiveness in improving learning and performance”. The call was contained in a PDF document and shared inter alia with the International Association of Computer Science in Sport’s listserv by email. Larry Katz is a professor at the University of Calgary. Andrew Waller and Mary Westell (2009) report that the University of Calgary has had an Open Access Repository since 2003 that contains “citations for over 14,000 items, approximately 9,000 of which connect directly to full text. Material types include journal articles, reports of many different sorts, datasets, and theses and dissertations”. Christoph Igel’s work at the Universitat des Saarlands has been recognised with the award of the Chief Learning Officer 2009 for his work in the development of virtual learning and sharing communities. In the context of the IJCSS call for papers it is interesting that a special edition on multimedia should be published in a conventional forum that limits the media that can be used and shared. This paper is a plea for a move to open access publishing and the transformation of intellectual property using Creative Commons approaches to community development as exemplified in the success of the Journal of Medical Internet Research (Gunther Eysenbach, 2009). It is a plea too to welcome and value the work of people like Brewster Kahle and John Willinsky. Alex Wright (2007) points out that “ever since the Web first started to flicker across the world’s computer screens, we have seen a bull market in hyperbole about the digital age”. This paper celebrates that social networks are human networks and that there is an evident need to balance claims made for digital networks with the personal interactions each of us has in our daily lives (see Photograph 1). Many commentators locate the development of social networks and digital scholarship in terms of the n.0 characteristics the worldwide web. Wikipedia provides a brief account of Web 1.0 and a much more detailed account of Web 2.0. More recently Greg Boutin (2009a; 2009b; 2009c) has been exploring the characteristics of Web 3.0. The European Future Internet Portal has shared a video about Web 3.0 and points out that 3.0 characteristics include: “an Internet of Services, where services are ubiquitous; an Internet of Things where in principle every physical object becomes an online addressable resource; a Mobile Internet where 24/7 seamless connectivity over multiple devices is the norm; and the need for semantics in order to meet the challenges presented by the dramatic increase in the scale of content and users”. It is interesting to note that when the Information Architects’ blog (2007) discussed Web n.0 to visualise Web trends (see Visualisation 1), the authors observed that “we have added a Web Generation number … please note that there are some websites that are Web 1.5, some that are 2.5, and some that are 0.5. This is not a mistake. Web 2.5 is what Facebook is up to… The Generation number is not necessarily qualifying, but it’s not surprising that websites that do well are usually above 1.0; some of them (like eBay and Wikipedia) were 2.0 long before the term was coined”. This visualisation locates the 200 most successful 2007 websites on the Tokyo Metro Map, ordered by category, proximity, success, popularity and perspective. A trendmap for 2009 is available. The potential of these n.0 changes for our communities of practice in sport is enormous and has been exemplified in Larry Katz’s Sports Technology Research Laboratory and Christoph Igel’s e-learning work. My own approach to developments in Sport n.0 were shared earlier this year with delegates at the Thirteenth World Congress of the International Association for Sports Information and in a SlideShare presentation about Institute 4.0. Mills Davis (2009) has discussed four types of web: 1.0 the Web (connects information); 2.0 the Social Web (connects people); 3.0 the Semantic Web (connects knowledge); and web 4.0 the Ubiquitous Web (connects intelligence). In the 4.0 space there will be “agent webs that know, learn and reason as humans do”. A report by the Smart Services CRC (2009) defines social media as “websites which build on Web 2.0 technologies to provide space for in-depth social interaction, community formation, and the tackling of collaborative projects”. There has been a proliferation of these media in recent years. As each of us explores these social media we have the opportunity to learn with and from others. Wikis have proven to be a powerful medium for sharing. An excellent example of what is possible is demonstrated in the Connectivism and Connective Knowledge CCK08 course wiki and in work by such people as Leigh Blackall (2009). The aggregation of our experiences through wikis offers enormous opportunities to grow communities. Gene Schembri (2008) has provided an interesting example of how a wiki can be used to support learning communities in sport. He observes that wikis enable people to: share information; discuss a topic and invite comment on it; provide open access to upload and share resources; and provide opportunities to edit material to ensure that content is current and accurate. Most wikis allow authors to create content without a knowledge of mark up language. Sue Vesper (2009) provides some interesting background information about wikis for those keen to explore their use. There are some fascinating projects underway to explore social media. Howard Rheingold’s work with the Social Media Classroom (2009) aims to “grow a public resource of knowledge and relationships among all who are interested in the use of social media in learning, and therefore, it is made public with the intention of growing a community of participants who will take over its provisioning, governance and future evolution”. Michael Wesch (2008) and his students at Kansas State University are exploring digital ethnography. Michael Wesch’s video The Machine is Us/ing Us (2007) has been viewed almost ten million times on YouTube, it has over 21,000 ratings and 8,000 comments. In 2008 a massive, open, online Connectivism course demonstrated how Sport n.0 might use social media to link and grow its communities of practice. This course, Connectivism and Connective Knowledge (CCK08), is the subject of the next part of this paper. In 2004 George Siemens proposed that “Connectivism presents a model of learning that acknowledges the tectonic shifts in society where learning is no longer an internal, individualistic activity. How people work and function is altered when new tools are utilized”. His identification of Connectivism as a learning theory for the Digital Age has stimulated enormous interest and discussion. A community keen to explore his ideas came together for the Connectivism and Connective Knowledge (CCK08) in the second half of 2008. Learning and knowledge rest in a diversity of opinions. Accurate, up-to-date knowledge is the intent of all connectivist learning activities. 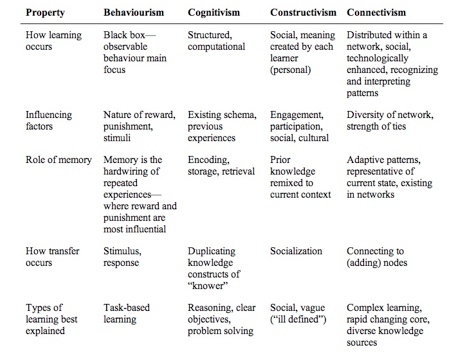 George Siemens (2009) has provided a comparison of learning theories to locate the distinctiveness of Connectivism. This comparison is presented in Table 1. Each week had a clearly defined topic. The topic was introduced by a short article or introduction or podcast. Links to external resources for additional reading/viewing were provided weekly. Short podcasts and opinion pieces explored disagreements. Discussions were held in asynchronous forums like blogs, Moodle, and wikis. The course code (CCK08) was used for tagging posts or sharing del.icio.us resources. Assignments and activities for participants who enrolled “for-credit” were required for completion/reflection on a weekly basis. Weekly live lectures and presentations were held. These lectures were delivered in Elluminate, UStream TV and BlipTV and were recorded for participants in different time zones. Guest presenters were involved throughout the course. Mind maps of key discussion topics were co-created with participants at the conclusion of each week. The time required by learners was a minimum of five hours per week (reading, assignments, etc) and a maximum of ten to fifteen hours (depending on learners’ expertise with online environments and familiarity with subject matter). At the end of the course George Siemens (2009b) summarised his involvement as a course facilitator: “I have spend a minimum of 12 hours per week on CCK08. Some weeks, especially at the start, were likely closer to about 30 hours”. Overall George estimated that the total time he spent on the CCK08 course was between 375-425 hours. There are many communities that have flourished as a result of the CCK08 course. Stephen Downes (2009a) has provided an overview of the course and its open access potential. Meetings – in person or online gatherings with an agenda. Projects – interrelated tasks with specific outcomes or products. Access to expertise – learning from experienced practitioners. Relationship – getting to know each other. Context – internally-focused or serving the wider world. Community cultivation – recruiting, orienting and supporting members, growing the community. Individual participation – enabling members to craft their own experience of the community. Content – a focus on capturing and publishing what the community learns and knows. Open ended conversation – conversations that continue to rise and fall over time without a specific goal. I believe the CCK08 is an important model for developments within the computer science in sport community. Its use of social media has enormous implications for the way knowledge sharing communities are supported and sustained. Importantly Connectivism acknowledges the place personal learning environments have in this process. The CCK08 course led to an incandescence of activity and a flourishing of social networks. The Daily produced during the course gives a feel for the digital scholarship stimulated by the course. Two examples of community building projects that arose from the course include Digifolios and Personal Learning Spaces and Connectivism, Technology, Web 2.0. Stephen Downes (2009b) argues that “the first phase of educational media was focused almost entirely toward learning management”. Social media have made a second phase possible. Stephen Downes characterises this phase as the personal learning environment (PLE). Tony Hirst (2009) explores some of the possibilities for PLEs in a time of “radical syndication” and “the uncourse attitude”. 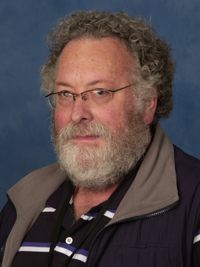 His work demonstrates some of the ways in which content can be packaged, bundled, unbundled, mixed, remixed, contextualised, commented upon and scheduled for delivery using freely available web tools and techniques that do not need a programmer to operate them. The United Kingdom’s Open University Platform (2008) is an excellent example of this approach as is a web site that addresses the mashable (2009) affordances of digital media. 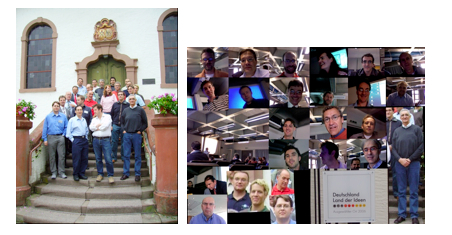 My involvement in the CCK08 course accelerated and focused my interest in social networks. During the course I used a range of social media to explore collaborative learning. I invested considerable energy in developing my blog Clyde Street and as part of the CCK08 course I posted each week and commented on colleagues’ blog posts. Visualisation 2 plots the increased readership of the blog since its inception in June 2008. Clyde Street attracted its highest monthly readership during March 2009. This coincided with two conferences at which I blogged live. One was the International Association of Sports Information 13th World Congress in Canberra. The other was the National Library of Australia’s Innovative Ideas Forum 2009 also in Canberra. Live blogging provides an opportunity to share presentations with colleagues within Australia and around the world. It offers an almost synchronous sharing opportunity as well as an asynchronous record for colleagues in different time zones. Microblogging services such as Twitter are now offering real time sharing of information in 140 character blocks of text. My experience in CCK08 encouraged me to develop a Ning site for the IACSS09 Symposium to be held in Canberra. The aim of this site was to build a social network around the work of IACSS and to create a pre-conference connection between delegates and organisers. It was defined as an unofficial site to avoid any confusion with the official Symposium site. 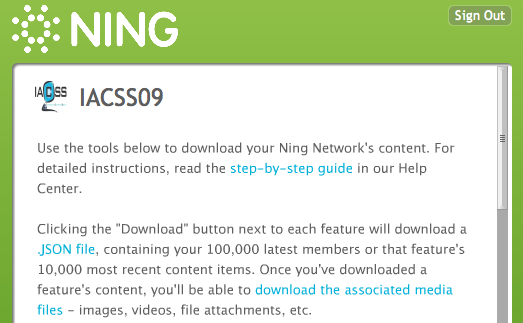 The Ning site was launched in December 2008 and one of the strong reasons for using the Ning suite of tools was its language potential. Ning offers the opportunity to use twenty-three languages on the site. The Language Editor page provides information about this functionality. Importantly it is possible to import language files from other Ning sites. My hope was that this agnostic feature would stimulate exchanges in a variety of languages (see Visualisation 3). One of the options available to Ning sites is to have an advert free skin and I chose this option (for a small monthly fee) to ensure that IACSS was not seen to be supporting any commercial activity by a third party over which IACSS had no control. These functions are located on one site and remove the necessity to use multiple sites for the social network. The CCK08 course discussed earlier in this paper demonstrated the potential of social media to grow networks linked by mutual interest. The IACSS09 Ning site is an example of a connectivist approach to social network development in computer science in sport. At present it awaits examples of non-English language use. The next step is to encourage drivers from IACSS to initiate this multi-lingual exchange. I believe this kind of exchange can lead to the production of remarkable open access materials. I conclude this paper with a brief discussion of open access publication as the logical outcome of a commitment to Connectivism, Sport n.0 and social networks. Lee Orsdel and Kathleen Born (2009) provide a detailed overview of the impact of the global 2008 financial crisis on library budgets. They report that “In an unprecedented move, the International Coalition of Library Consortia issued a statement to publishers in January warning that double-digit budget cuts over the next few years are expected and calling for creative strategies from publishers who want to keep their business. The Association of Research Libraries followed with its own statement in February, underscoring the need for publishers to take this crisis seriously”. This financial crisis is occurring at a time when the impact of Open Access journals is growing (Shu-Kun Lin, 2009). It is occurring at a time when there are increasing calls for and commitments to Open Access in universities such as Harvard, the Universite de Geneve, and Roehampton. It is occurring at a time too when the Public Knowledge Project (2009) is growing its reach as is the Internet Archive. It is occurring at a time when there is increasing discussion of the Edgeless University (Peter Bradwell, 2009) in which “technology is changing universities as they become just one source among many for ideas, knowledge and innovation. But online tools and open access also offer the means for their survival. Through their institutional capital, universities can use technology to offer more flexible provision and open more equal routes to higher education and learning”. Matt Wedel (2009) has raised some fascinating issues in relation to the links between published articles in peer review journals and the posts written in blogs. He draws attention to what he calls the Intolerable Problem: “which is that people online can critique papers and present new evidence and arguments in a format that is impermanent and not peer-reviewed. It’s intolerable because on one hand such material is not currently (operative word) citable in most outlets, and on the other hand repeating it sans citation in peer-reviewed literature smacks of plagiarism (to some, but not to all)”. When I first contemplated writing this paper I posted my thoughts online in this post. I received two responses about the principle of sharing a paper on line. Both responses encouraged me to contemplate what a collaborative paper might look like. I do find myself attracted to Matt Wedel’s (2009) argument that “I still think that the investment of blog posts with respectability, value, citability, or whatever rests entirely with readers, and always will. Options range from treating posts like papers to treating them like bar conversations to treating them like spam. You decide”. The availability of WebCite functionality will transform this debate: “a WebCite®-enhanced reference is a reference which contains – in addition to the original live URL (which can and probably will disappear in the future, or its content may change) – a link to an archived copy of the material, exactly as the citing author saw it when he accessed the cited material”. If accepted for publication this paper will appear in 2010. In order to retain some currency I have chosen to use references mainly from 2009 in the drafting of this paper. By the time the special edition of IJCC on multimedia appears we will have had the Seventh IACSS Symposium. At this Symposium it is intended to use as many of the social network tools available to connect delegates in novel ways that are appearing elsewhere. As IACSS develops its own Symposia formats it will be interesting to see how these formats resonate with those organised by CERN (2009) and AACE (2009) amongst others. It is a most remarkable time of change in the ways we communicate. Bates, T. (2009). e-Learning and 21st century skills and competences. Journal Article (On-line/Unpaginated) http://www.tonybates.ca/2009/06/24/e-learning-and-21st-century-skills-and-competences/ accessed 29 June 2009.
http://wikieducator.org/Composing_educational_resources accessed 29 June 2009. Boutin, G. (2009a). Tying Web 3.0, The Semantic Web And Linked Data Together — Part 1/3: Web 3.0 Will Not Solve Information Overload. Article (On-line/Unpaginated) http://www.semanticsincorporated.com/2009/05/tying-web-30-the-semantic-web-and-linked-data-together-part-13-web-30-will-not-solve-information-ove.html accessed 29 June 2009. Boutin, G. (2009b). Tying Web 3.0, The Semantic Web And Linked Data Together – Part 2/3: Linked Data Is A Medium. Article (On-line/Unpaginated) http://www.semanticsincorporated.com/2009/05/tying-web-30-the-semantic-web-and-linked-data-together-part-23-linked-data-is-a-medium.html accessed 29 June 2009. Boutin, G. (2009c). 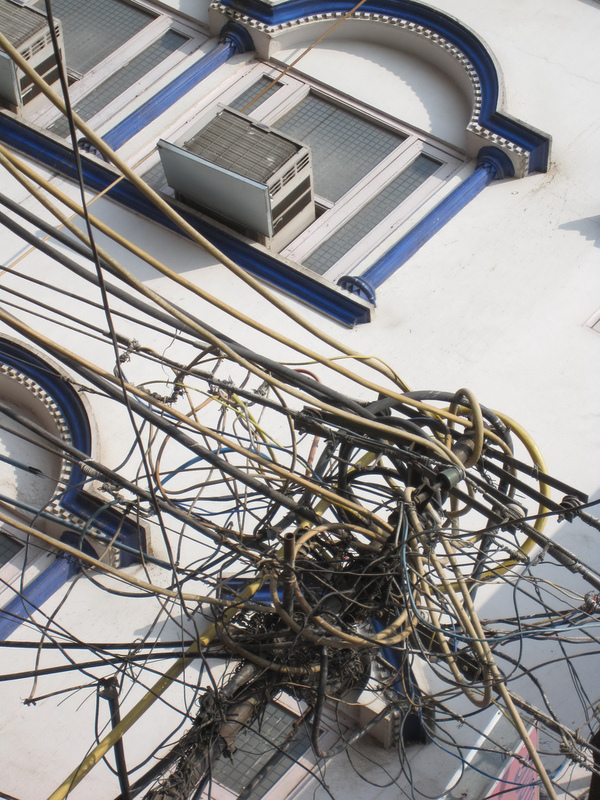 Tying Web 3.0, The Semantic Web And Linked Data Together – Part 3/3: Structuring Chaos. Article (On-line/Unpaginated) http://www.semanticsincorporated.com/2009/05/tying-web-30-the-semantic-web-and-linked-data-together-part-33-structuring-chaos-.html accessed 29 June 2009. Bradwell, P. (2009). The Edgeless University. London: Demos. http://www.demos.co.uk/files/Edgeless_University_-_web.pdf?1245715615 accessed 29 June 2009. Davis, M. (2009). Web3 And The Next Internet – New Direction and Opportunities for STM Publishing. SlideShare Presentation http://www.slideshare.net/Mills/web3-and-the-next-internet-new-directions-and-opportunities-for-stm-publishing-davis-2009-web?src=embed accessed 29 June 2009. Downes, S. (2009a). Access2OER: The CCK08 Solution. Journal article (On-line/Unpaginated) http://halfanhour.blogspot.com/2009/02/access2oer-cck08-solution.html accessed 29 June 2009. Downes, S. (2009b). Beyond Management: The Personal Learning Environment. Keynote address EdMedia World Conference, Hawaii, June 2009 http://www.aace.org/conf/edmedia/speakers/downes.htm accessed 29 June 2009. Downes, S. (2006). Learning Networks and Connective Knowledge. Journal article (On-line/Unpaginated) http://it.coe.uga.edu/itforum/paper92/paper92.html accessed 29 June 2009. Eysenbach, G. (2009). Open Access journal JMIR rises to top of its discipline. Journal article (On-line/Unpaginated) http://gunther-eysenbach.blogspot.com/2009/06/open-access-journal-jmir-rises-to-top.html accessed 29 June 2009. Fitzgerald, R., Barras, S., Campbell, J., Hinton, S., Yoni, R., Whitelaw, M., Bruns, A., Miles, A., Steele. J. & McGinness, N. (2009). Digital learning communities and social software. Australian Learning and Teaching Council http://eprints.qut.edu.au/18476/ accessed 29 June 2009. Hart, J. (2009). What is Social Learning? SlideShare presentation http://www.c4lpt.co.uk/sociallearning/sociallearning.html accessed 29 June 2009. Hirst, T. (2009). They Put Silage in Silos, Don’t They? So Feed Me. Invited paper EdMedia World Conference, Hawaii, June 2009 http://www.aace.org/conf/edmedia/speakers/hirst.htm accessed 29 June 2009. Information Architect Blog (2009). Web Trend Map 4. Article (On-line/Unpaginated) http://informationarchitects.jp/wtm4/ accessed 29 June 2009. Information Architect Blog (2007). 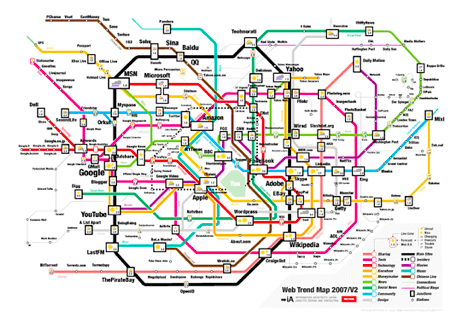 Web Trend Map 2007 Version 2.0. Article (On-line/Unpaginated) http://informationarchitects.jp/ia-trendmap-2007v2/ accessed 29 June 2009. Lin, S-K (2009). Full Open Access Journals Have Increased Impact Factors. Molecules 2009, 14(6), 2254-2255 http://www.mdpi.com/1420-3049/14/6/2254/ accessed 29 June 2009. Lyons, K. (2009). A Fourth Age of Sports Institutes. SlideShare presentation http://www.slideshare.net/Postillion/a-fourth-age-of-sports-institutes accessed 29 June 2009. Lyons, K. (2008). IASI in Canberra. Article (On-line/Unpaginated) https://keithlyons.wordpress.com/2008/08/12/iasi-in-canberra-2009/ accessed 29 June 2009. Marin, A. & Wellman, B. (2009). Social Network Analysis: An Introduction. Book Chapter (forthcoming) http://www.chass.utoronto.ca/~wellman/publications/newbies/newbies.pdf accessed 29 June 2009. Maron, N. & Smith. K. (2009). Current Models of Digital Scholarly Communication: Results of an Investigation Conducted by Ithaka Strategic Services for the Association of Research Libraries. Ann Arbor, MI: Scholarly Publishing Office, University of Michigan, University Library vol. 12, no. 1, February 2009 http://quod.lib.umich.edu/cgi/t/text/text-idx?c=jep;cc=jep;rgn=main;view=text;idno=3336451.0012.105 accessed 29 June 2009. Orsdel, L. & Born, K. (2009). Reality Bites: Periodicals Price Survey 2009. Journal Article (On-line/Unpaginated) http://www.libraryjournal.com/article/CA6651248.html accessed 29 June 2009. Rheingold, H. (2009). Social Media Classroom/ Co-laboratory. Screencast http://vlog.rheingold.com/index.php/site/video/social-media-classroom-co-laboratory-screencast1/ accessed 29 June 2009. Schembri, G. (2008). Wiki http://ncodmelb.wikispaces.com/ accessed 29 June 2009. Siemens, G. (2009). What is Connectivism? Week 1:CCK08. Article (On-line/Unpaginated) http://docs.google.com/Doc?id=anw8wkk6fjc_14gpbqc2dt accessed 29 June 2009. Siemens, G. (2008a). A Brief History of Networked Learning. Article (On-line/Unpaginated) http://ltc.umanitoba.ca/wiki/Connectivism#Week_4:_History_of_networked_learning_.28September_29-October_5.29 accessed 29 June 2009. Siemens, G. (2008b). Who is still participating? Article (On-line/Unpaginated) http://ltc.umanitoba.ca/connectivism/?p=182 accessed 29 June 2009. Siemens, G. (2004). Connectivism: A Learning Theory for the Digital Age. Article (On-line/Unpaginated) http://www.elearnspace.org/Articles/connectivism.htm accessed 29 June 2009. Smart Internet CRC (2009). Social Media State of the Art. Australia: Smart Internet CRC. http://produsage.org/files/Social%20Media%20-%20State%20of%20the%20Art%20-%20March%202009.pdf accessed 29 June 2009. Vesper, S. (2009). Wikis Overview. Wiki http://learningweb2.wikispaces.com/Wikis+Overview accessed 29 June 2009. Wedel, M. (2009). Blogs, papers and the brave new digital world. : Matt’s thoughts. Article (On-line/Unpaginated) http://svpow.wordpress.com/2009/06/11/blogs-papers-and-the-brave-new-digital-world-matts-thoughts/ accessed 29 June 2009. Wesch, M. (2008). An anthropological introduction to YouTube, YouTube video http://www.youtube.com/watch?v=TPAO-lZ4_hU accessed 29 June 2009. Wesch, M. (2007). Web 2.0 … The Machine is Us/ing Us. You Tube video http://www.youtube.com/watch?v=6gmP4nk0EOE&feature=channel accessed 29 June 2009. White, N. (2009). Red-Tails in Love: Birdwatchers as a community of practice. Article (On-line/Unpaginated) http://technologyforcommunities.com/2009/03/red-tails-in-love-birdwatchers-as-a-community-of-practice/ accessed 29 June 2009. Wright, A. (2007). Glut: Mastering Information Through the Ages. Washington: National Academies Press. Categories: CCK08, Communication, Community, Computer Science in Sport, Creative Commons, Digital Media, Networks, Open Access, Sport, Stephen Downes, Twitter, Writing | Tags: CCK08, Connectivism, Open Access, Rejection, social media, Social Networks, Sport, Sport n.0, UCNISS, xWeb | Permalink.